Was Esther Jungreis’s husband a cousin of her’s? Maybe Jungreis is a common Hungarian name. I believe that they were related. They were indeed related and yes, Jungries is a very common Hungarian “Rabbinical” name, but all from one big family. They are all either decsendants or related to the great Menuchas Usher of Tchenger, Rabbi Usher Anshil Jungries OB”M. In the link that Cheskel provided there is alot of information (in Yiddish) on the Jungries Dynesty, Rabbi Avrohom Jungries we are tlaking about now, was the SIL of Rabbi Zvi Hirsch Hakohen who was the Rav in Congregation Eitz Chaim of Paterson NJ, and prior to that he was the las Rav in Derechke, Hungarey. 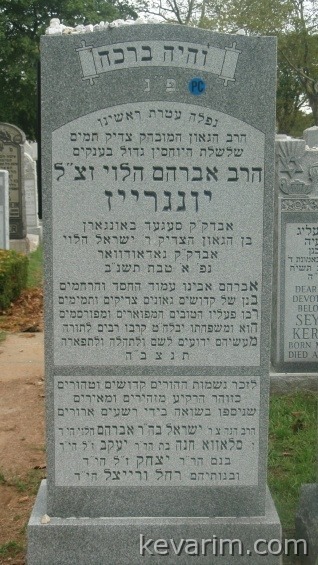 Rabbi Hakohen is buried in EY.